In this wide-ranging conversation with MOCRA Director Terrence Dempsey, SJ, artist James Rosen discusses his childhood in Detroit, his friendship with art critic Meyer Schapiro, the development of his distinctive oil/wax-oil emulsion painting technique, and his use of "veils" to camouflage his images. James Rosen has had a distinguished career as an artist and lecturer. Educated at Cooper Union, Wayne State University, and Cranbrook Academy of Art, he has taught at the University of Hawaii, the University of California - Berkeley, Augusta College, and the Pennsylvania Academy of the Fine Arts. He has exhibited widely and his works are in collections including the Metropolitan Museum of Art, MoMA, the Whitney Museum, and the Ashmolean Museum. Influenced by artist Mark Rothko and art historian Meyer Schapiro, Rosen's work demonstrates his keen understanding of art history, mastery of form, and ability to imbue canvases with mystery. He is represented by Gallery Paule Anglim, San Francisco, and the Leyton Gallery, St. John's, Newfoundland. MOCRA is fortunate to have over 100 Rosen works either in its collection or on long-term loan. His work has been included in many of MOCRA's group exhibitions over the years and never fails to draw appreciative comments from visitors. In Fall 2010 MOCRA presented The Artist and the Capable Observer, a solo exhibition that included work from the 1950s to the present, offering viewers the opportunity to observe Rosen’s visual journey through paintings, watercolors, drawings, and prints. Jump to Audio Extra: "The Artist as Swimmer"
Rosen uses the Aristotelian term entelechy in relation to his practice of holding something back in creating his works, so that they are "completed by the observer." Entelechy, as defined by the Encyclopedia Britannica, is "that which realizes or makes actual what is otherwise merely potential." Rosen was a frequent visitor to the Detroit Institute of Arts (DIA) as a child. Albert Pinkham Ryder 1947-1917), produced moody works with allegorical subjects, including The Tempest (1892). Charles Demuth (1883-1935) was known for his watercolors and oils, and moved in creative circles with artists such as Georgia O'Keeffe, Arthur Dove, and Marsden Hartley, and writers including William Carlos Williams, Gertrude Stein, Eugene O'Neill, and Wallace Stevens. Rosen saw Demuth's painting My Egypt (1927) in a traveling exhibition at the DIA. Rosen studied at The Cooper Union. Franz Kline (1910-62) was a major figure in the Abstract Expressionist movement in American painting. Nicholas Marsicano (1908-91), taught at The Cooper Union for 42 years. He was friendly with Kline, Mark Rothko, Jackson Pollock, Raoul Hague, and Phillip Guston, and his students included Eva Hesse and Milton Glaser. Jean Auguste Dominique Ingres (1780-1867) was a major French Neoclassical painter whose output included about 450 exquisite portrait drawings. Meyer Schapiro (1904-96) was a major figure in twentieth-century art criticism. He took an interdisciplinary approach to the practice and focused on "style" (meaning an artwork's formal qualities and visual characteristics) as a key to interpretation. Fr. Dempsey references a quotation from Rosen emphasizing setting aside an "ample reserve" for the observer in a work of art. Rosen draws on two sources here: the Hellenistic Jewish scholar Philo, and the Biblical book of Genesis. Philo (20 BCE-50 CE), active in Alexandria, Egypt, attempted a synthesis of Jewish biblical exegesis and Hellenistic philosophy. Among his writings is a commentary on the Biblical story of Joseph, who was sold into slavery by his brothers but later became the second-in-command to the Pharaoh of Egypt. Joseph achieved his position by interpreting a dream of the Pharaoh to mean grain should be set aside in reserve for a time of famine.This collection of Philo's writings also includes "On Flight and Finding." Classical Greek sculptor Polykleitos (5th c. BCE) composed a treatise (or "Kanon") laying out a model for representing the human form in sculpture based on ratios and symmetries of individual parts to each other and to the whole. Early Italian Renaissance painter Giotto (1266/7-1337) helped to reintroduce a sense of naturalism to Western European art. The Ognissanti Madonna is a massive altarpiece painted on panel, over 10 feet in height. It now resides in the Uffizi Gallery in Florence. Rosen's 1982 homage to this work, titled Madonna Enthroned (pictured at left), is in the collection of the Berkeley Art Museum and Pacific Film Archive at the University of California - Berkeley. A similar work mentioned by Fr. Dempsey, the Homage to Guido da Siena: La Maestà, was included in the MOCRA exhibit The Artist and the Capable Observer. Read a MOCRA blog post about the uncanny presence of the work even while crated. Marsilio Ficino (1433-99) was a significant humanist philosopher of the early Italian Renaissance, noted especially for his recovery of the works of Plato. Plotinus (c. 204/5-270 CE) is considered to be the founder of Neoplatonism, a school of philosophy that had a strong influence on Hellenic, Gnostic, Christian, Jewish, and Islamic thought in the centuries to come. The writings of Plotinus were organized after his death into a collection called the Enneads . Central to his thought is "the One" or "the Good," a First Principle of reality that transcends all Being, containing no division, multiplicity or distinction. Everything else (created reality as we experience it) emanates from the One. Each emanation (and subsequent emanations from earlier ones) is an imperfect reflection of its source. Leonard Bocour (1910-93) founded Bocour Artist Colors in New York City in 1932 and became a paint supplier to many notable artists, including Mark Rothko, Jackson Pollock, Willem de Kooning, Helen Frankenthaler, Morris Louis, and Kenneth Noland. Read a transcript of a 1978 interview with Bocour in the Smithsonian Archives of American Art. Rosen distinguishes between the cold wax/oil emulsion product Bocour provided to him (similar to the product described here) and the more typical encaustic painting practice, in which pigment is added to heated beeswax. Miscibility is a property of liquids that allows them to mix completely and form a homogeneous solution. An emulsion is a mixture of two or more immiscible (unblendable) liquids. Yaddo is an artists' community located on a 400-acre estate in Saratoga Springs, New York, that offers offers residencies to professional creative artists. Ad Reinhardt (1913 - 67) was an American painter who explored a number of styles but is perhaps best known for his square Black canvases from the last decade of his life. Learn more about Reinhardt on the Museum of Modern Art website. Morris Louis (1912-62) was an American abstract painter. Joseph Stella (1877-1946) was an Italian-born, American Futurist painter, best known for depicting industrial America. The Camouflaging Society of Sonoma County published a slim volume in 1971 titled, The qualities of camouflaging: that relation of man's workmanship to his perception of the world. This being an account of the experiences of the Sonoma County Camouflaging Society including a historie-geographie and field notes. Find it on WorldCat. Gerard Manley Hopkins (1844-89), a Jesuit priest, was among the most innovative poets of the nineteenth century, with his metrical development called "sprung rhythm" and striking use of language and imagery. Rosen refers to Hopkin's concept of "inscape ," which relates to the individual essence and uniqueness of every physical thing. Hopkins in turn drew on the thought of medieval theologian and philosopher Duns Scotus (c.1265-1308), who coined the term " haecceity" to denote "the discrete qualities, properties or characteristics of a thing which make it a particular thing." Fr. Dempsey is referring to the uncanny way in which the Madonna's eye seems to capture the gaze of the viewer. This MOCRA blog post describes the experience. See also 16:20, above. The thirteenth-century Chartres Cathedral is famed as one of the best-preserved examples of French High Gothic architecture. As Rosen notes, it is particularly famed for its stained glass windows. Don Emblen (1918 - 2009) was a poet and teacher. He was honored as Sonoma County's first poet laureate. Read a remembrance of Emblen by author Joan Frank. Matthias Grünewald's Isenheim Altarpiece is among the best-known depictions of the crucifixion, and certainly among the grisliest. In Rosen's 1974 Homage to Grünewald: The Isenheim Altarpiece, the details of the suffering are veiled and the body, while still conveying a sense of torturous pain, dissolves like wisps of incensing rising in sacrifice. 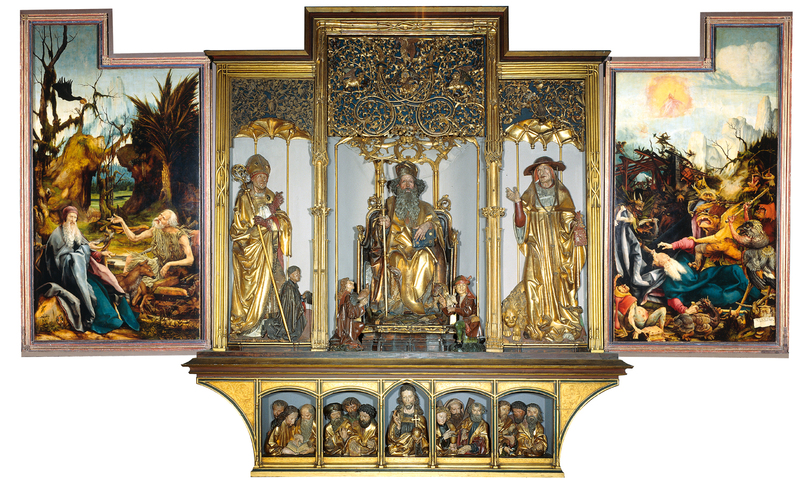 Discover more about the Isenheim Altarpiece (1512 - 16) on the Unterlinden Museum website. This detail shows the upraised arm of Christ described by Rosen. The oil-wax/oil emulsion technique used by Rosen often leaves little visible evidence of his brushstrokes.